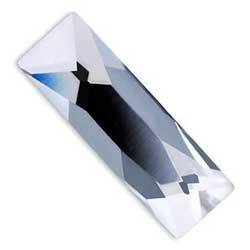 Swarovski Cosmic Baguette Flat Back 2555 features asymmetrical cuts on a baguette shape. The irregular cuts and layered cutting results in a stunning brilliance with maximum light reflections. This is both classic and modern. The uniform edges also fully allows for creative cummulative placement in rows or blocks. Crystal, 4 colours, 4 effects.